This category excites collectors because each item was personally held and written on by the artist, and each one’s unique. For some, that’s a thrill you can’t beat. 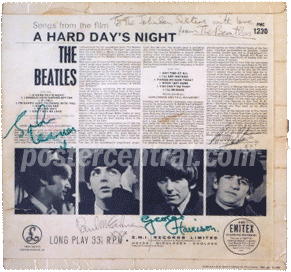 Autographs can be found on almost anything, from small scraps of paper up to record albums and guitars. 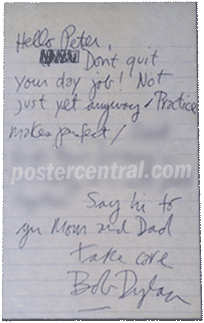 Documents and handwritten items run the gamut from penned letters (the individual Beatles mailed lots of short notes to fans in 1963) to performance, managerial, publishing and other contracts. This is a field, however, fraught with more authenticity issues than any other. 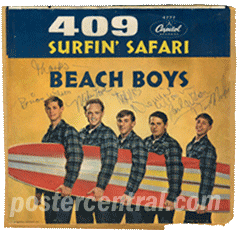 The general consensus is that over 95% of the autographs offered on big-name artists are not authentic, creating a situation of caveat emptor in the highest degree. 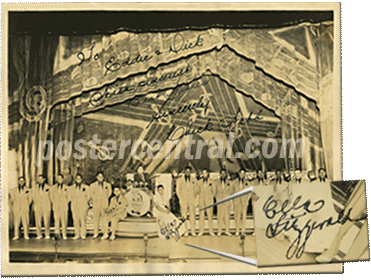 Fake autographs usually take two forms: so-called “secretarial signatures,” where a well-meaning associate signed in the absence of the star, usually at the star’s behest; and out-and-out forgeries, done simply for dishonest profit. 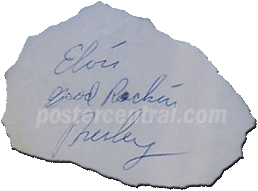 Phonies are commonly found on the short and simple side, most often just regular autographs. As the document grows longer and the words add up, the odds can shift somewhat more in favor of it being real. For one thing, letters, documents and such tend to have a “back story” to them, which can really help authenticate an item. Please feel free to submit your own examples for discussion, authentication and possible inclusion here (if you desire). And remember, I pay top dollar for the very best autographs, signed documents and handwritten items. 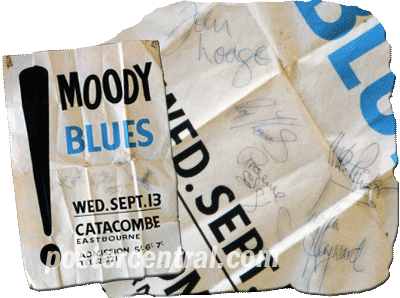 The Moody Blues, complete set of band autographs on a 1967 U.K. concert poster, signed that night after the concert by Justin Hayward, John Lodge, Mike Pinder, Ray Thomas and Graeme Edge; Chick Webb and Ella Fitzgerald, a vintage 8x10” photo signed and inscribed by Chick up above and signed by Ella down below on her white dress, from the late 1930s (Webb died in 1939); The Beach Boys autographed picture sleeve for “Surfin’ Safari”/“409”, released in the summer of 1962 and almost certainly signed upon release by Brian Wilson, Mike Love, Dennis Wilson, Carl Wilson and David Marks, with both Brian and Dennis adding “Thanks”; The Beatles’ A Hard Day’s Night U.K. album signed by John Lennon, Paul McCartney, George Harrison and Ringo Starr for a British journalist in the summer of 1964; Bob Dylan handwritten letter dating from 1961, his first year in New York City; and Elvis Presley's autograph “Elvis Good Rockin’ Presley” signed in Memphis in 1954 on the back of an envelope, for fan Opal Walker, referring to his second Sun Records single which had just been released.